The most striking features of the great churches of East Anglia are roofs, bench ends and screens, and to a lesser extent, fonts. All gave the medieval craftsman scope for carving and coloured decoration, and though subject to decay and vandalism over the centuries, a good deal remains to delight us today. The purpose of the screen was to divide the chancel, with its altar, from the nave, which was often used for secular purposes. It was an invariable part of the furnishing of every church until the Reformation, usually placed directly beneath the chancel arch, though sometimes brought forward slightly so that it could stretch right across the nave and aisles. The screen was generally surmounted by a loft, upon which stood the Rood, a giant figure of Christ crucified. The Reformation saw the destruction of virtually every Rood and the great majority of lofts, though the screens themselves were often spared as they were a useful feature in the ordering of the church. Most figure sculpture and painting depicted thereon, however, was generally defaced. The two principal areas where screens remain are East Anglia and the South-West, though the two types differ radically. East Anglia in the Middle Ages was the richer of the two areas, and the churches are therefore bigger and loftier. So in Norfolk and Suffolk the typical screen rises much higher than in the south-west, has tall, narrow openings and very slender posts between the bays, and a general air of lightness and elegance. Though isolated examples of stone screens remain in Suffolk and Cambridgeshire, it is wooden screens for which Norfolk is famous, and parts of more than two hundred are said to remain. From the fourteenth century there are screens at Merton, Watlington and Thompson, in which the heads of the open upper part are decorated with curvilinear tracery above the heads of the arches. The similarly early screens at Edingthorpe and Hempstead are distinguished not only by their tracery, but by the exceptional quality of the painting on the dado. The great majority of screens date from the fifteenth century, and their open work decoration is of three main types. Firstly, those in which the openings have arches reaching to the bressumer, decorated simply with rows of cusping. Secondly, those which have additional ogee arches inserted below the arch heads; these ogees are richly crocketed and surmounted by finials rising to the main arch heads. Thirdly, there are some which are similar to the last type but have a complex fretwork of tracery above the additional ogees. Examples of the three types can be found at Barton Turf, Cawston and Acle respectively. The most famous screen is undoubtedly at Ranworth, but there are others which run it close, if not for the quality of the painted figures on the dado, then for the decoration of the whole piece. The screens at Southwold and Bramfield in Suffolk are notable for the gesso work which enhances the backgrounds of the figures; at Barton Turf there is a beautifully painted representation of the nine orders of the angelic hierarchy; the design of the screen at Ludham is notable not only for its painted figures, but also for the inscription naming the donors and bearing the date of the screen, whilst Cawston, even without its loft, gives perhaps the best overall picture of what the screen might have looked like in all its original glory, complete with the painted background of the Rood. The pre-eminence of the screen at Ranworth is partly due to its size and preservation, and partly due to its quality. The best description was made by W.G. Constable, in his articles on East Anglian Rood Screen paintings eighty years ago. The screen has wings extended north and south of the chancel arch, each forming the background for an altar, and between them and the main screen, parclose screens extend forward into the nave, an unusual feature not found elsewhere in East Anglia. The decoration is very rich, and though it is possible to trace the work of several hands on the figure paintings, the unity of both design and colour suggests the presence of one controlling mind. The base of the main screen is occupied with the twelve apostles, each with his emblem and his name inscribed beneath each figure. The figures on the reredos screens are bigger, and include, on the south side, the Virgin and Child. But the finest paintings are those on the parclose screens, especially the figures of St Michael and St George. The former, in particular, debonair and fantastic, as he strides jauntily amid the serpent's coils, is unique in England. The gaiety of his dancing draperies and the glitter of his dazzling gems seem altogether of southern origin, quite different from the serried ranks of static figures which figure so prominently in English work of the period. 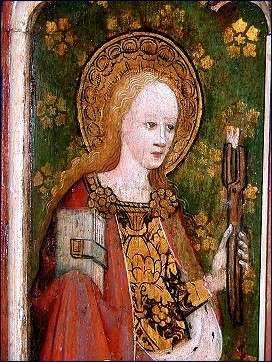 Aymer Vallance suggests a Catalan influence for both St. Michael and St. George, citing an altar-piece at Panafel in the province of Barcelona as their inspiration. Among other delights on the Ranworth screen are the demi figures of angels above the main figures on the parclose screens. Their typically English features, and their feathered bodies, are regular features of the Norwich School of glass painting, which flourished in the fifteenth century. Such angels appeared in the tracery lights of many windows throughout the county. The decorative treatment of the whole screen is especially rich. The backgrounds to the figures are alternately red and green, and in the reredos panels the background to the angels is red when the background to the main figure is green, and vice versa. The flowers scattered over the backgrounds, and those forming a running pattern on the white vaulting of the screen and on the frames of the panels, are in some cases faithful representations of local flowers. There is, however, no evidence of gesso work in relief, as found on some of the richer screens in Suffolk. Even the east face of the screen is decorated with flowers, alternately on green and red backgrounds. Not far from Ranworth are two other very fine screens, Barton Turf and Ludham. The chancel screen at Barton Turf consists of twelve painted panels, of which the first and second on the north side represent St. Apollonia and St. Sitha, followed by the nine orders of angels and finally St. Barbara. Iconographically, the screen is remarkable, consisting of the finest surviving representation of the heavenly hierarchy in English medieval art. Although examples in attained glass are still to be found in the tracery lights of many churches, the only other to survive on a screen is at Southwold in Suffolk. The armour on two of the Barton Turf angels is a curious mixture of early and late forms, and according to Constable, points to a date of around 1480, though the flamboyance of some of the other costumes may indicate a slightly later date. Nonetheless, some more recent scholars, notably Lasko and Morgan, have given the screen a date some forty years earlier, basing their opinion on the lightness and informality of the painting and a similarity to the former altarpiece at St. Michael-at-Plea, Norwich, now in the Lady Chapel of the Cathedral. Potestates, armed, with a devil in a chain, and scourge. Vertutes, four-winged, with cap, sceptre, feathered body and legs. Dominaciones, four-winged, with triple crown and chasuble. Seraphyn, six-winged, feathered body, girdle of fire, censer. Cherubin, six wings, full of eyes, feathered body, linen girdle, hands outspread. Principatus, four-winged, girdle with bells; holds a glass vial and a palm. Troni, six-winged, long-sleeved robe; holds a church and pair of scales. Archangeli, two-winged in plate armour; stands in a citadel and holds mace and sword. Angeli, in alb, with alms box at the girdle; holds a spear. Two naked souls on a rock, praying praying. The predominant colours are red and green, with haloes, feathers and some details on the robes being in gold. The quality of the drawing equals, if not surpasses, that at Ranworth (St George and St. Michael excepted), the figures being varied in attitude and action, and a consistent attempt seems to have been made to give them solidarity. In particular the figure of St. Sitha, clad in the costume of the day and carrying the keys and purse of a housewife, is particularly beautiful painting. The panels representing St. Apollonia with her pincers and tooth and St. Barbara with her castle are equally fine. The panels on the main screen are far superior to those which decorate the screen across the south aisle, one of which represents Henry VI, with orb and sceptre. These panels seem to have been cut down, and look stiff and formal, arranged frontally. It has been suggested that they might have come from one which was displaced by the present fine screen in the nave, though the recent trend towards an early date for the latter would discount this theory. Though the painted figures may be less good, the screen at nearby Ludham is in many ways even finer. It certainly gives a fine impression of the medieval set-up. Above the screen is a painting of the Crucifixion. The boards on which it is painted were found in the rood-loft staircase, and now fill the chancel arch. It is not easy to read the figures apart from those of Christ, the Virgin and John, but two seraphs seem to be at the sides, and there are others, thought to be Longinius, the centurion and Mary Magdelene. On the other face of the boards (which were turned round for the purpose) are a Protestant substitute in the form of the Royal Arms of Elizabeth. The screen itself is finely proportioned, consisting of one light divisions with ogee arches within the pointed arches. An inscription carved along the sill reads: Pray for the sowle of John Salmon and Cecily his wyf that gave forten pounde and for alle other benefactors. made in the year of the lord god MCCCCLXXXXIII. (1493). The twelve saints have their names inscribed, and include the East Anglian saint, St Wulstan, crowned, and holding a sceptre and a scythe. He also occurs on screens at Barnham Broom, Burlingham St. Andrew and Sparham. As in the side screens at Ranworth, the backgrounds are divided horizontally by a band behind the figures' heads, and a floor is provided on which each figure stands. A further point of richness on the Ludham screen is the elaborate carving in the spandrils and at the base. The two most impressive screens that remain to be discussed in detail are situated away from Broadland in the agricultural heart of central Norfolk - at Cawston and Attleborough. The great church of St. Agnes at Cawston is one of the county's most splendid in every respect. Six-winged angels stand on the hammer-beams of the roof, which also has a cornice of cherubins, much original seating remains, backless in the aisles, and a fine octagonal font is raised on a step decorated with quatrefoils. Above the chancel arch, similar to Ludham, are the painted remains of the background to the Rood. The surface is red, with traces of leafage, surrounding a large white silhouette of the Cross. On either side there are similar silhouettes of pinnacled canopies which surmounted the head of each of the accompanying statues of Mary and John respectively. The screen is tall and retains its doors, and there are a total of twenty painted figures on the dado, emanating from two very different workshops. Beginning on the north side there are St. Agnes and St. Helena, followed by six of the Apostles, whilst the doors, as so often in Norfolk, portray the four Doctors of the Church: Jerome, Ambrose, Gregory and Augustine. To the south are six more Apostles and Sir John Schorn. The last named was rector of North Marston, in Buckinghamshire c. 1290, and acquired a great reputation as a miracle-worker, on one occasion conjuring the devil from a boot, as shown here. His well at Marston was noted as a cure for gout, and the devil escaping from the boot is probably emblematic of pain being driven from the foot. He also appears on the screens at Gateley and Suffield. Constable maintains that he first fourteen panels derive from one workshop and the remaining six from another. The former are painted direct onto the panel, and are crudely drawn, the mantles falling in elaborate and artificial folds over the rich brocade robes, and the heads, hands and feet drawn with hard outlines, the beards and hair arranged in dark, wiry locks. Pevsners revising editor, Bill Wilson, finds that these may be the work of two hands, however. The remaining figures are altogether superior, painted on parchment and stuck on to the boards. There is a marked variety in pose, suggesting individual characterisation. St Matthew holding his spectacles to his eyes in a most realistic manner, whilst the draperies, in contrast to the first group, fall simply and naturally, conveying a distinct impression of reality rather than formality. Parish records, unearthed by the indefatigable Simon Cotton, show that the paintings were completed between 1490 and 1510. The eight panels to the north were paid for by William Atereth and his wife, and in 1504 there was a bequest by Richard Browne to paint a pane in the rood loft. Some of the cartoons for the apostles at Cawston were used on the screens at Marsham and Worstead (the latter commissioned in 1512), and the gesso patterns on the framework of the screen are identical with some at Marsham and Aylsham. In many ways the screen at the former collegiate church of Attleborough is the most remarkable of all, for it combines most of the features present in those already mentioned, even though the painted figures lack the quality of the others. The former central tower now stands at the east end of the church, the collegiate choir having been destroyed, and the screen spans the full 52ft width of the nave and aisles. The ribbed west coving remains complete, together with the loft parapet. The doorway has a cusped ogee arch, whilst the other bays have single lights and no tracery, just the fine cusping at the top. In four bays either side of the chancel arch the whole opening is blocked by a panel with a large painted figure, similar to the arrangement at Ranworth, doubtless forming the background to a pair of nave altars. The coving retains paintings of the arms of each of the twenty-four old English sees, painted early in the 17th century. The large paintings forming the retables have below them inscriptions commemorating the donors, Richard Hart and his wife, Margaret. Above the screen are the remains of a large painted rood, with a large cross in the centre. The upper row of figures has Moses on the right and David on the left, and the angels at the ends hold instruments of Christ's Passion. The whole is surmounted by an Annunciation, a subject quite unusual in this position. It is now necessary to discuss the two most interesting screens in Suffolk, Southwold and Bramfield, the first a splendid town church and the second a remote rural place not far away, with a detached round tower. Both screens are possibly richer in decoration of any of those previously mentioned. The screen at Southwold is more impressive, spanning the whole width of the church. The dado is painted with no less than thirty-six figures, whilst the upper part has tall arcading without any tracery but with prettily cusped and subcusped arches, with the ribbed coving to the east preserved. The painted panels fall into three sections, of very differing quality. The section facing the north aisle is the finest so far as figure painting is concerned, and shows the nine orders of angels together with heraldic material. According to Aymer Valence, and repeated by some later writers, the figures bear a resemblance to those at Barton Turf, but this seems entirely superficial, and they lack the sensitivity and luminosity of the latter. The central section depicts the twelve apostles, and similarities have been noticed with both the Cawston and Ranworth paintings in the soft folds of the mantles and the brocade patterns of the under-garments. What is unparalleled is the splendour of the patterned gesso relief forming the background. The section across the south aisle shows eleven prophets, more linear in their treatment and stiffly posed within their narrow panels. The faces of all the figures were repainted by G. Richmond, R.A. in 1874. What is possibly the most striking feature of the Southwold screen is the rich and varied gesso patterns used freely on the pilasters and the carved canopies over the figures, as well as on the backgrounds as already noted. On the spandrels there is also wavy lane decoration and the naturalistic floral patterns found at Ranworth. The sections in the aisles are less elaborate. The screen at Bramfield is equally rich, but on a much smaller scale with just six one-light divisions, yet retaining its vaulted coving to the east and west. The central Tudor arch is surmounted by two ogee arches, each supporting perpendicular tracery in the same way as the one-light divisions. The vaulting is richly decorated with white, red, blue and gold, incorporating the familiar naturalistic foliate patterns. Just five heavily repainted figures remain on the lower part of the screen. I have suggested that a great deal of screenwork remains, often cut down and removed from its original position, or sometimes just a panel or two placed against a wall. The serried ranks of saints portrayed do not differ greatly in colour or pose, and some have been identified as being by the same hand, even though they might be reversed in the way that cartoons for stained glass often were. Yet among these saints some are of particular interest, as on the screen at North Burlingham, which, dating from 1528, is the latest known of any Norfolk screen. The dado has twelve panels, two of which are blank, but among the remaining figures are St. Withburga, St Wulstan and St. Etheldreda, all of whom are specially connected with East Anglia. St. Wulstan, patron saint of agricultural labourers, was born at Bawburgh, near Norwich, and has been mentioned earlier. Etheldreda was the daughter of Anna, King of East Anglia who left her husband , took a vow of perpetual virginity, and founded a convent at Ely, of which she became abbess. Her sister, Withburga, became abbess of a convent at East Dereham, which is shown in the North Burlingham panel, inscribed Ecclesia de Est Dereham. Both sisters also appear on the screen at Barnham Broom. Another unusual feature of the Burlingham screen is that all the figures are placed on pedestals, suggesting that they might be derived from sculpture. Other saints specially connected with East Anglia are represented from time to time, principally, of course St. Edmund, who also appears in stained glass, in wall paintings and in wood on bench-ends and misericords. Others include Felix, Anna, already mentioned, Ethelbert (Burnham Norton), and St. William of Norwich, a boy who was said to have been murdered, scourged and crowned with thorns by the Jews in Norwich on 24 March 1144. A scene at Loddon vividly depicts his Crucifixion. Other saints popularly depicted at the end of the Mediaeval period are mainly foreign, and in East Anglia mainly Flemish in origin, suggesting the ever closer links between the two parts; St. Juliana at Hempstead is but one example. The screen at Loddon, though the entire upper section is missing, is highly unusual in that for the most part it shows scenes and not individual figures. Each bay is treated as a single unit, and the main scenes show the Annunciation, the Nativity, the Presentation in the Temple and the Adoration of the Magi, preceded to the north by the Martyrdom of St. William of Norwich mentioned above. He is bound saltire-wise to stakes, and the Jews are wounding his side and collecting the blood in a basin. All the figures are now drawn with firm black outlines on a cream ground, the robes being mainly red and green with gold details, and a late date, perhaps as late as 1520, is usually suggested for them. Pictorial perspective is also suggested on a unique panel, or rather two panels, at Fritton, which contain portraits of the donor with his wife and children. A damaged inscription in Latin asks for prayers for the soul of the donor, John Bacon and his wife, but the paintings can hardly be said to be portraits proper. The sizes of the figures vary according to their nearness to the spectator, so creating a sense of space within the panel. References in church records to the work suggest a date between 1510 and 1520, though nothing is known of the family. The remaining figures are crudely painted, yet the upper section of each panel, above the inscription, is painted with the rare and expensive blue and covered with gold stars, suggesting that this screen was originally of splendid appearance. Simon Cotton has shown that is rare to be able to assign the donation of a complete screen to one person or family in a way that we can at Ludham. At Worstead the screen was executed and finished in 1512 at the cost of John Alblastyr and his wife Benedicta, whilst the screen at Trunch has a Latin inscription recording that the screen was made in 1502. As outlined earlier, the Cawston screen had at least three separate donors. There was formerly an inscription, beginning below the figure of St. Agnes, saying that eight panels on the north side were paid for by William Atereth and his wife: Pray for the sowlis of Willia Athereth and Alice his wyff the weche dede iiiv panys peynte be the Executors lyff." Parish records refer to a bequest in 1504 by Richard Browne to paint a pane in the rood loft. Yet as early as 1460 "John Barker gave 10 marks towards the building of the Rood Loft, commonly called the candle-beam." Which still leaves several of the existing screen panels unaccounted for. Similar confusion exists about the donors of the somewhat primitive screen at Westhall, in Suffolk. We find the same decoration with wavy bands of colour and naturalistic foliage as at Ranworth, but here all similarities end, for the figures are clumsily painted and differ greatly in style and size. In some figures there is an attempt at modelling, whilst in others the treatment is boldly linear and some hands are so large, they seem to be wearing goalkeepers gloves! A possible reason is that each panel might have been the gift of a different donor, each employing a different painter, who did his work independently of the others, using cartoons obtained from a variety of sources. Where the Westhall screen is unique is the representation the Transfiguration. Figures of Saints or Prophets form the most usual decoration for the lower parts of East Anglian screens, particularly in Norfolk, though some make do with conventional or abstract ornaments or simple diaper patterns. The latter occur on screens at Deopham, Great Massingham and Saxthorpe in Norfolk, for example, whilst the fine screen at Acle the ornamental motifs include IHS and E with crossed arrows, depicting St. Edmund. This screen is tall and exceptionally good, the two-light divisions having ogee heads. The tracery is in two tiers, that is to say there is a transom with tracery below in addition to the ogee arches above with thin tracery. At Tivetshall diaper patterns alternate with heraldic motifs. The screen at Binham Priory, formerly decorated with painted figures, was painted over in white after the Reformation and then covered with black-letter texts from Cranmer's Bible of 1539. Several details of the original beautifully painted figures are now showing through. The heads of St. Michael and of Christ as the Man of Sorrows are particularly striking. There was no mystical significance in screens in churches; they were primarily utilitarian, their purpose being to guard or fence off an altar. Among screens the rood screen is, of course, the most important, because, standing as it did at the entrance to the chancel, its purpose was to protect the principal or high altar. Subordinate altars, like those described at Ranworth, or those in side chapels, were protected by parclose screens. Some of these screens, to judge by what remains today, were of equal splendour to those at the entrance to the chancel. Just three may be mentioned in some detail, the first being East Harling, in Norfolk. As if the rood screen here, were not enough (it has carved quatrefoils, mostly heraldic, but one with a crucifixion with Mary and John, the cross growing out of the reclining Jesse), the screen to the south chapel has three-light divisions complete with its ribbed coving, whilst at right angles to this screen is another, earlier one with shafts instead of mullions. All these are splendidly coloured. The little known church of Beeston-next-Mileham also has the remains of a fine rood screen, complete with twelve defaced figures, but cruelly missing the top - it finishes crudely at the joints which held the wooden vaulting supporting the loft. The parclose screens enclosing the chapels of Our Lady and St. John are particularly fine. That on the south side dates from the end of the fourteenth century, and the later one in the north aisle is of superb quality, with wide, thickly crocketed ogee arches and close tracery. The untreated oak has a beautiful silvery hue, whilst there are traces of colour on the dado. The parclose screens of the south and north chapels at Dennington in Suffolk are two prodigious pieces, miraculously well preserved. They are like rood screens of the usual type with one-light divisions, crocketed ogee arches and panel; tracery above with a top cresting. Above that the whole loft is preserved with daintily traceried openwork balustrading to the outside as well as the inside. The colour has doubtless been discretely renewed in recent times. The parclose screens at Dennington give us as good an idea as possible of how a mediaeval rood screen looked when complete. To see the rood group in position above the screen we have to go to Eye, also in Suffolk, where, thanks to sensitive additions by Sir Ninian Comper in 1925, we can see what our forbears intended. The screen up to the rood loft is original work of 1480. There is a rich cupsed and subcupsed entrance arch and a carved foliage trail, gilded on a rich blue background, on the rail above the dado, which contains fourteen painted figures. The ribbed coving is supported in the front by traceried pendant arches, and above this is an upper tier of ribbed coving, crested at the top, with an inscription "Pray for John Gold" The loft and the figures are Comper's work, and help conjure up a splendid picture of mediaeval imagery and colour. Thanks to Simon Knott for his inspiration and enthusiasm.